J. E. Miller, Munene, T., Gardner, J. V., and Armstrong, A. A., “U.S. Extended Continental Shelf Cruise to Map Gulf of Alaska, Eastern Pacific”, Center for Coastal and Ocean Mapping / Joint Hydrographic Center, Durham, NH, 2018. J. V. Gardner, “The Morphometry of the Deep-Water Sinuous Mendocino Channel and the Immediate Environs, Northeastern Pacific Ocean”, geosciences, vol. 7, 4. MDPI, 2017. J. V. Gardner and Armstrong, A. A., “U.S. Extended Continental Shelf Cruise to Map Gaps in Kela and Karin Ridges, Johnston Atoll, Equatorial Pacific Ocean”, CCOM/JHC, Durham, NH, 2014. B. D. Andrews, “Bathymetric terrain model of the Atlantic margin for marine geological investigations.”, 2013. S. Pe'eri, McLeod, M. A., Lavoie, P., Ackerman, S., Gardner, J. V., and Parrish, C. E., “Field calibration and validation of remote sensing surveys”, International Journal of Remote Sensing, vol. 34. pp. 6423-6436, 2013. S. Pe'eri, Gardner, J. V., Ward, L. G., Morrison, J. R., and Lillycrop, J., “Identifying subtidal coastal environments using airborne lidar bathymetry (ALB)”, American Geophysical Union (AGU). San Francisco, CA, USA, 2007. S. Pe'eri, Gardner, J. V., Ward, L. G., Morrison, J. R., and Lillycrop, J., “The seafloor as key component for the success of lidar in bottom detection”, Joint Airborne LIDAR Bathymetry Technical Center of Expertise Coastal Mapping and Charting Workshop (JALBTCX). Seattle, WA, USA, 2007. K. Schwehr, Sullivan, B. M., and Gardner, J. V., “Google Earth Visualizations: Preview and Delivery of Hydrographic and Other Marine Datasets”, U.S. Hydrographic Conference (US HYDRO). Norfolk, VA, USA, pp. 0-0, 2007. J. V. Gardner, “U.S. Law of the Sea Cruise to Map the Foot of the Slope and 2500-m Isobath of the Florida Escarpment and Sigsbee Escarpment, Northern Gulf of Mexico Continental Marg. Cruise Report”, University of New Hampshire (UNH), Center for Coastal and Ocean Mapping (CCOM)/Joint Hydrographic Center (JHC), 2007. J. V. Gardner, “U.S. 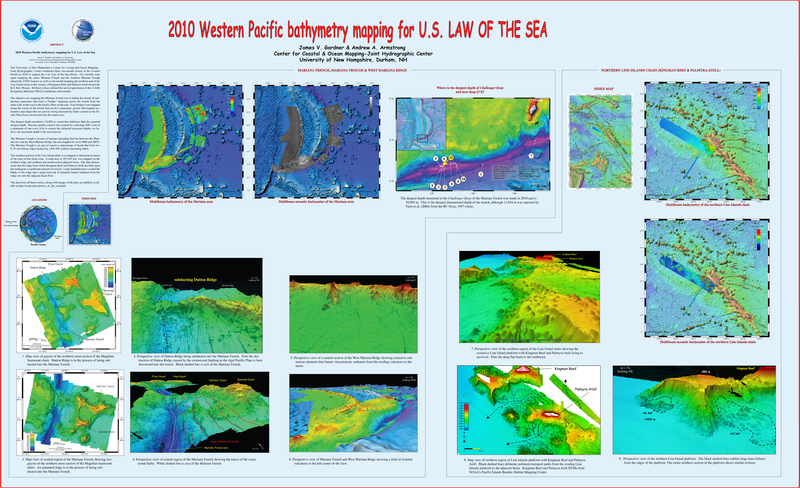 Law of the Sea Cruise to Map the Western Insular Margin and 2500-m Isobath of Guam and the Northern Mariana Islands. Cruise Report”, University of New Hampshire (UNH), Center for Coastal and Ocean Mapping (CCOM)/Joint Hydrographic Center (JHC), 2007. S. Pe'eri, Philpot, W. D., Guenther, G., and Gardner, J. V., “Shoreline Mapping Using LIDAR Red-channel Waveforms”, American Geophysical Union (AGU). San Francisco, CA, USA, 2006. J. V. Gardner, “Law of the Sea Cruise to Map the Western Insular Margin and 2500-m Isobath of Guam and the Northern Mariana Islands. Cruise Report”, University of New Hampshire (UNH), Center for Coastal and Ocean Mapping (CCOM)/Joint Hydrographic Center (JHC), 2006. 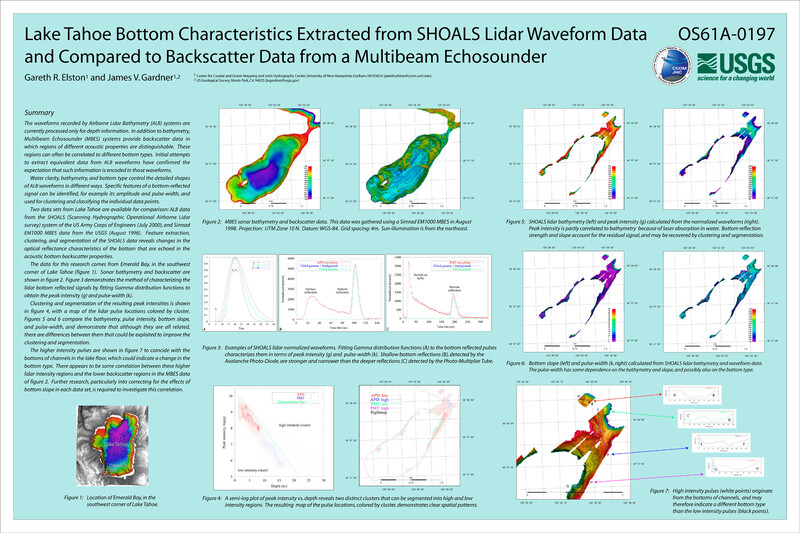 J. V. Gardner and Beaudoin, J., “High-Resolution Multibeam Bathymetry and Acoustic Backscatter of Selected Northwestern Gulf of Mexico Outer Shelf Banks”, Gulf of Mexico Science and International Journal, vol. 23. Marine Environmental Sciences Consortium of Alabama, pp. 5-29, 2005. G. M. Kent, Driscoll, N. W., and Gardner, J. V., “Lake Tahoe's submerged record of active faulting is characteristic of the Basin and Range”, Geological Society of America (GSA), vol. 33. Cedar City, UT, USA, pp. 0-0, 2002. J. V. Gardner, “A Reappraisal of Deepwater Reefs Along the NW Florida Outer Continental Shelf”, UC Santa Cruz Marine Sciences Seminar . St. Andrews, New Brunswick, Canada, pp. 0-0, 2002. G. Gelfenbaum and Gardner, J. V., “Assessing Damage on the Major Submarine Deltas of Southern Puget Sound After the 2001 Nisqually Earthquake Using High-Resolution Seafloor Multibeam Mapping”, Geological Society of America (GSA), vol. 34. Corvallis, OR, USA, pp. 0-0, 2002.